When you imagine the average PlayerUnknown’s Battlegrounds player, it’s likely you think of someone who doesn’t look much like the Twitch streamer who calls herself GrannyGottaGun. Her oversized gaming headset sits over a head of silver hair, and as she concentrates on the screen, concern deepens the age lines on her face. Now, she’s just posted her first PUBG win, and it’s just a heartwarming thing to watch. GrannyGottaGun and her partner have made it to the final circle, playing duos on Sanhok. 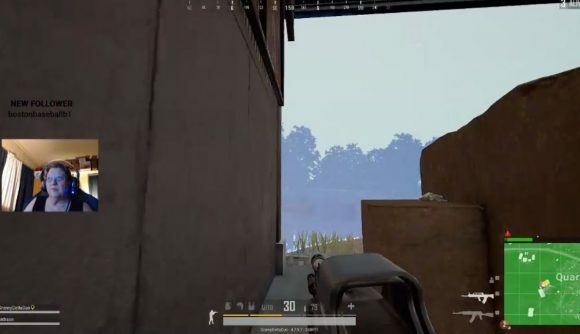 The circle has ended up collapsing on an outbuilding by Sanhok’s Quarry, and they take up positions inside the open-air structure. “We got this, we got this – just one to go,” her partner says. GrannyGottaGun, carrying what looks like an AKM with holographic sights, finds cover behind a large square stone. The pair quickly realize that their last remaining opponent has to come into the building or die to the circle. There’s the crack of a rifle. “Was that you?” GrannyGottaGun asks her partner, with what seems like a practiced sense of good communication. “No, that was him,” he replies. A grenade goes off nearby, and she checks to make sure her partner is okay. When their enemy finally makes a dash into the building, it’s her partner, not GrannyGottaGun, who takes him down. But hanging in until the very end was enough to earn her her first Chicken Dinner. She fires a few rounds into the downed body for good measure. GrannyGottaGun posted the clip to the PUBG subreddit. “I’m just an old lady trying to keep up with you boys,” she said in the post. “It might not seem like much, but I’ve finally survived to the end of a game for the first time ever. “I never played games before PUBG, so this really meant a lot to me,” she wrote. You can follow GrannyGottaGun over on her Twitch channel. As the clip ends, she tells her partner she needs a break and gets up from her chair – a dedicated racing-style gamer chair, it’s worth noting. Her mic is still hot, and you can hear her continue celebrating in the background.